DICOM is a file format of digital image obtained by medical scanner such as x-ray CT and MRI. The file includes several tag and values of medical information with image data. Common x-ray CT scanner is operated by the DICOM format file and protocol. Digital image of material is indicated as CT value on DICOM file. 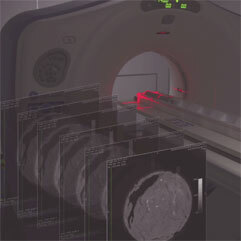 The CT value provides some physical information of the material, such as water content, density, etc. DICOM viewer can reconstruct 2D and 3D image of scanned data set. For example, OSIRIX is one of free software to handle DICOM file on hi-spec Macintosh. 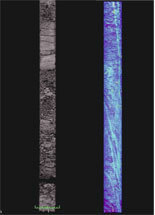 Everybody can access original scanning data files after moratorium period of the expedition as well as scientific objectives of IODP expeditions via this library. The X-ray CT scanning generates a DICOM file for each core section. Most of the DICOM files are couple of hundred MB, but do not worry. Send your request to an IODP curator through the link provided in this web site ! We will copy send data you requested on a DVD-ROM and send it. Quick guide : how to request data files ? 1. Search favorite core sample by Expedition, Site, Hole, Core number. 2. See Preview image on SIO7 Data center. 3. Request a curator to copy DICOM files. We can provide you copy of xCT DICOM files on DVD disc. Please remember the maximum data size of DVD is commonly 4.7GB. We would ask you to reduce number of files, if you request many files at a time. We can provide copy of many files, if you send large size HDD to us.